Gifts for the yogis on your list! Are you searching for a unique gift for your yoga enthusiast? Perhaps you need a few items for your own list? Here’s a roundup of some unique yoga-inspired gifts that we love. Kiss The Sky is committed to evoking a lifestyle that frees the mind, inspires the body, and eases humanity’s environmental footprint. 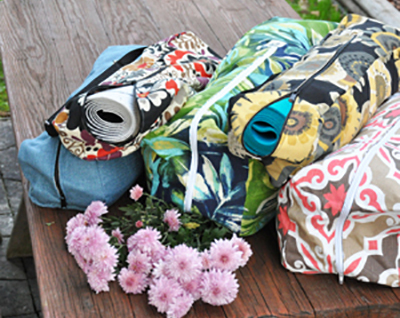 Tucked in the Green Mountains of Vermont, Kiss the Sky creates high-quality yoga performance yoga mats that satisfy your wellness needs while sustaining natural resources, reducing waste using upcycled materials, and protecting the environment for future generations. Website. 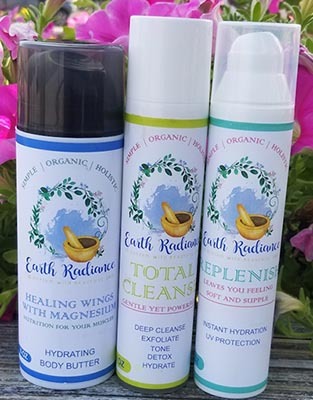 Earth Radiance skin care products are simple, organic, and holistic. Combining a western approach and knowledge of Ayurveda, Earth Radiance scientists studied cell supporting and rejuvenating organic ingredients to formulate a range of products that help create balance and achieve wellbeing and longevity of the skin, body and mind. The radiance of our energy, skin, and personality is a direct reflection of what we put on it. Earth Radiance’s formulas are 100% natural. You won’t find any harmful chemicals, preservatives, synthetic compounds, animal derived ingredients, or hidden or unclear ingredients here. Website. The Dorjebajra Tibet Shop brings you unique selection of Tibetan and Nepali Fair Trade Handicrafts from the Himalayas to you. 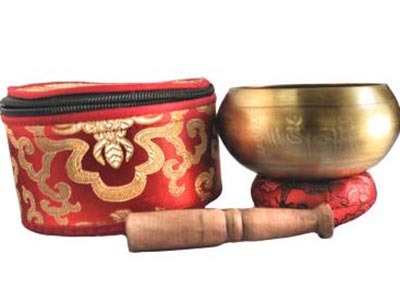 Shop for fair trade Tibetan Singing bowl, Charka singing bowl, Statue, meditation supplies and much more. Free Shipping all orders $ 50 and more. Website. 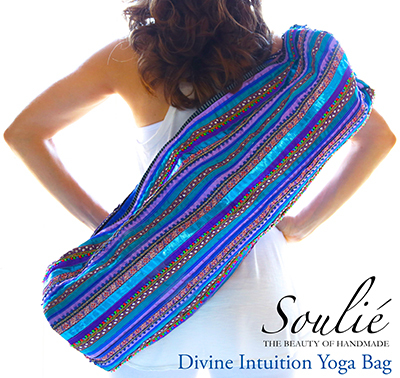 Breathtakingly beautiful, artisan made accessories for your yoga practice, lifestyle and home. At Soulié, each piece is ethically sourced & provides beautifully dignified work for Soulié’s artisan partners. Each artisan made accessory incorporates craft traditions in a new and modern way, preserving both craft and culture while empowering you to trust in your own unique beauty. Every item sold supports Soulié’s Artisan Scholarship Fund, providing skills training for artisans all over the world. Website. Handcrafted and sustainable ayurvedic copper vessels that maximize your health while transforming our global community. Drinking from the Tamba copper vessels is a spiritual connection to the founding fathers of Yoga. 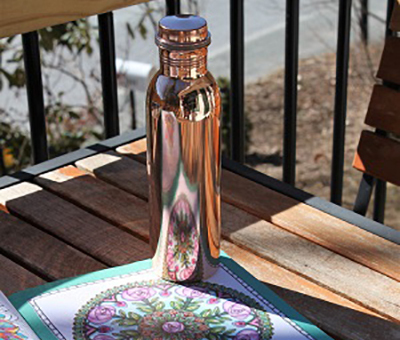 This gorgeous line of drink-ware is the ultimate gift for a Yogi who values the beauty and the tradition of Yoga. A portion of every sale supports promoting water sanitation initiatives in India. Blessings! Website. The ideal solution to elevate your home practice, regardless of what type of flooring you place it on! The Practice Base provides the stability to move through sun salutations and into challenging balancing poses and inversions with just enough cushion to provide supple support for Yin Yoga, and protection from the occasional fall. 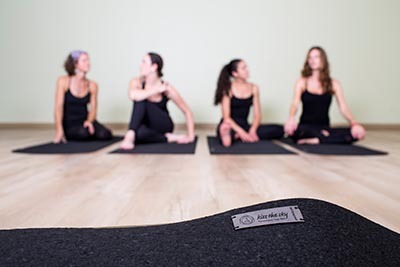 Made from densely compressed recycled foam wrapped in an easy to clean, non-slip, and eco-friendly vinyl you can use it with or without your favorite yoga mat! Website. 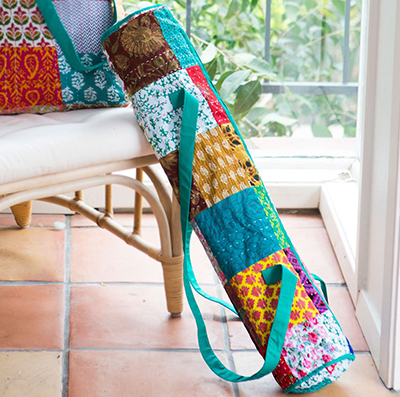 These stunning yoga mat bags are made with you in mind. Two different sizes and dozens of fabrics are available to be sure to match your unique personality and equip you with everything you’ll need for your yoga classes. Each bag features a zipper pocket for keys, phone, etc, an adjustable strap, and a long zipper on the main pouch which allows easy access to your mat. Most also include a block pocket. Each bag is fully lined and will satisfy your needs for years. Use code YOGA30 for 30% off! Website. ZenHappy Jewelry specializes in creating one-of-a-kind heirloom quality gemstone malas that speak to your soul and put a smile on your face. 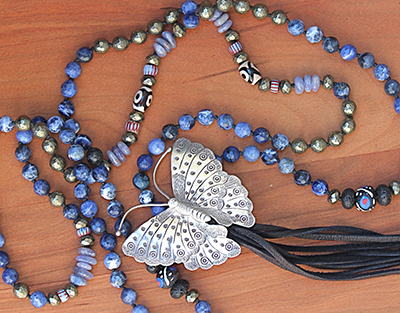 Choose from one of their available “art-to-wear” creations or request a custom mala designed specifically for you. From spectacular malas, to healing gemstone bracelets and aromatherapy diffuser jewelry, ZenHappy has something special for everyone on your holiday gift list! Website. Namaslay your Gifting this Holiday. 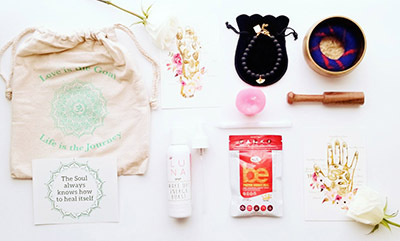 Shop BuddhiBox for monthly Yogi care packages, ethical accessories, and handmade jewelry. Plus for every gift purchased, BuddhiBox will make a donation to Feed The Children, on your behalf. Save 15% off subscriptions and gifts with code ‘buddhibox15.’ Website. 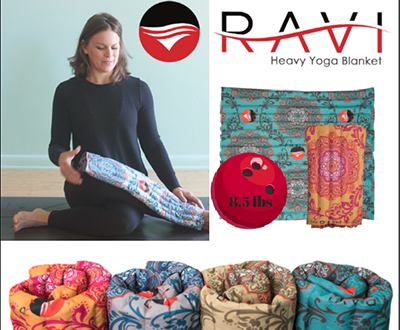 RAVI Weighted blankets for Wellness, Therapy & Yoga. RAVI is a 8.5lb hug in a blanket – compact, portable and versatile for relaxing at home or in your yoga practice. Deepen your practice with a game changing yoga prop that is unlike traditional props. With the RAVI you will experience the heavy blanket therapeutic effects in restorative postures, additional depth and torque in YIN stretches and maximize strengthening in your movement practices. Relax & Heal & Yoga with RAVI. Website. Matr Boomie is an ethical gift company working with artisans in India. Each product is elaborately designed in Austin and handcrafted in India using fair practices. Each product has a sense of time and place and speaks of age old art forms. Matr Boomie does various development projects for its artisan partners in India. They envision to create a ‘just world’, one product at a time! Website. Take your practice to the next level with RAD self-myofascial release (SMR) tools. They can be used before, during or after your flow for acute point release to flush out waste materials from your soft tissue and achieve optimal mobility and recovery. When used regularly, our tools unlock your body’s true movement potential whenever it fits in your schedule. Website. 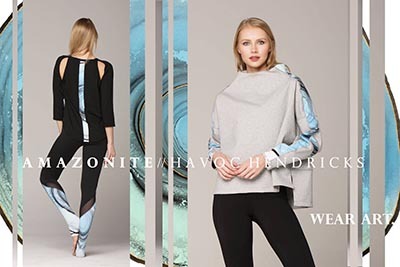 Yogavated Athletics is an eco-friendly, limited edition activewear brand designed to motivate & inspire through using art pieces & the intentions behind them. All of the art on our leggings was once hand painted by artists around the world. Each art piece has a mantra that encompasses the intention and is carried through you when wearing our activewear. We are handmade in USA using zero waste production practices. All excess fabric is collected & stuffed into dog beds then donated to shelters. Website. Welcome to the first truly eco-friendly legging – made from the planet’s favorite fabric. Biodegradable & compostable, without sacrificing comfort, style, or breathability. Those leggings you love, with the stretchy fabric? They’re made with polyamides (fancy speak for plastic) & irresponsible practices, polluting waterways & loading up landfills. Leggings from recycled plastic? Non-recyclable – that’s the end of the line for them. Shop Aqua Vida’s revolutionary activewear for you and the planet. Website. Love these products? Enter our holiday sweepstakes November 26th – December 20th to win a gift for YOU! ENTER HERE.